Ford (F) unveiled a surprise this week: It's relaunching the Lincoln brand. The company is committing more than $1 billion for a slew of new Lincoln models, a robust promotional campaign, and even a Super Bowl ad -- a first for Lincoln. Actually, it's not just "Lincoln" anymore. As of Monday, Lincoln will be called the Lincoln Motor Company. Since Henry Ford's days, Lincoln has been the company's luxury brand. In recent years, though, Lincoln has grown long in the tooth. Its cars were just dressed-up Ford models, critics said, no match for the polished products from BMW (BAMXF) or Lexus. And sales have fallen a long way. Lincoln clearly needed a lot of work if it was going to be relevant in the 21st century. Now, that work has started -- and Ford has a big new market in mind for its old brand. Luxury cars are an important market for most automakers. It's not just the prestige, but the profits: Luxury models are much more profitable per car sold than the ordinary models. If you're an auto company looking for growth, you've got to be a contender in the luxury market. Consider this example: The Audi brand accounts for just a tiny fraction of the Volkswagen Group's (VLKAY) worldwide sales. But Audi accounts for almost half of VW's total profits. That hasn't escaped the attention of Ford's archrival, General Motors (GM). In China, which has become the world's largest auto market, GM is the leader ... at least in terms of volume. But VW, which is a close second to GM in the sales race, makes much more money in China -- because Audi is the hot luxury-car brand in China. GM wants a piece of that action, and it is committing big bucks to put Cadillac on par with Audi and the other German luxury brands -- and not just in China, but around the world, including in the U.S.
GM's effort, which is likely to include several new super-luxury cars developed from scratch, is expected to take several years to bear fruit. Meanwhile, Ford may be beating GM to the punch. Ford is a late-comer to the Chinese auto party. Only a few years ago, Ford had almost zero presence in China. But several years of hard work and more than $5 billion in investment later, the Blue Oval is an up-and-comer in the Middle Kingdom. Already, the Ford Focus is one of China's best-selling cars -- and many more Ford models will hit the Chinese market over the next few years. Like GM, Ford has paid attention to the booming luxury-car market in China. Audi is the undisputed leader, in part because of its styling: Audi's smooth, curvy designs are much more appealing to Chinese consumers than the sharp, angular styling favored by Cadillac. This is where Lincoln comes in. 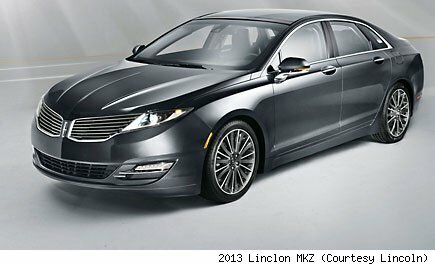 Ford is reworking the entire Lincoln lineup, starting with the just-launched MKZ sedan. The new models have -- you guessed it -- smooth, curvy styling that should go over well in the Middle Kingdom, and elsewhere. But Ford isn't setting out to compete with BMW and Audi directly. Instead, it's taking a cue from another luxury leader, Toyota's (TM) Lexus brand. Rather than the taut sports-car-like handling favored by the Germans, Lincoln -- like Lexus -- will emphasize a different vision of luxury: smooth and quiet, with cutting-edge safety features and impressive, cushy interiors. Can Ford Really Compete with the Likes of Lexus? Ford's mainstream products have come a long way in recent years, moving toward the top of the global charts. But its luxury brand has lagged. With this big investment in Lincoln, Ford has made clear that it plans to put Lincoln back on the luxury-car map in a big way. Given the competition, that's an ambitious plan. Too ambitious for Ford? Don't bet against them: The man that Ford just promoted to Lincoln's top job, Jim Farley, has a very impressive resume. That resume has many highlights, but there's one big one: Until he was hired away by Ford CEO Alan Mulally, Jim Farley used to run Lexus. Motley Fool contributor John Rosevear owns shares of Ford and General Motors. Follow him on Twitter at @jrosevear. The Motley Fool owns shares of Ford. Motley Fool newsletter services recommend Ford, BMW, and General Motors.